Create table of contents in Excel with no VBA macro involved. For this, just select the top cell of the destination range and click on the add-in icon. Your table of contents with hyperlinks to all the worksheets in the current workbook will appear straight away. 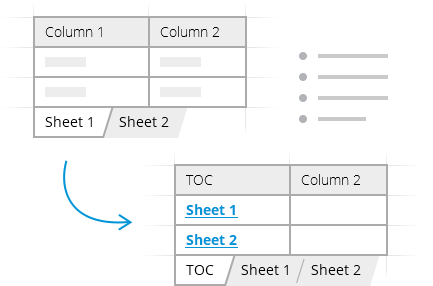 Create hyperlinks to all sheets in the workbookYou can create a table of contents on each sheet to easily navigate back and forth. Choose the place for your TOCSelect the top cell for the table of contents, so it will appear exactly where you need it. What is Table of Contents and what do I need it for? 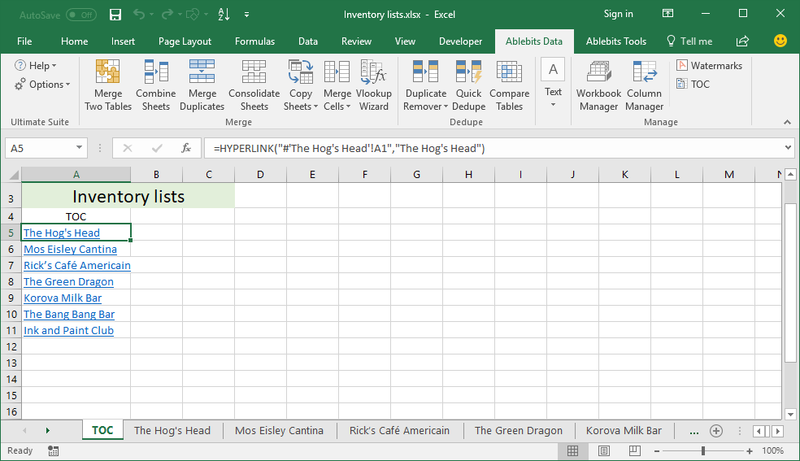 Table of Contents is an add-in for Excel that creates a list of all sheets with hyperlinks to them. How to create hyperlink in Excel between sheets? Select the top cell for the table of contents in your workbook. 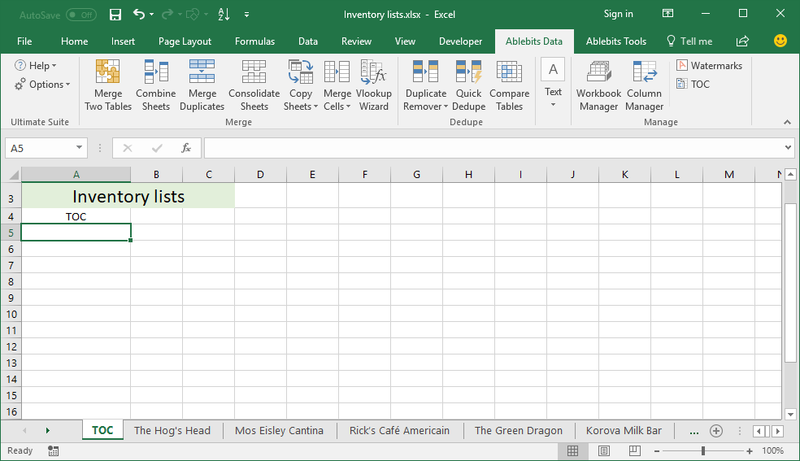 Click on the Table of Contents add-in icon in Excel ribbon. Excel doesn't have a built-in way to add a table of contents to a workbook. The task can be solved with a VBA macro or you can use the Insert Hyperlink command to get your table of contents. In this case, you'll have to create links to each sheet manually. Obviously, the more sheets you have, the more time-consuming this option is. Is there a limit to the number of sheets to create a table of contents? There is no limitation to the number of sheets in a workbook. Can I create a table of contents if I have only one sheet? Can I create an Excel table of contents on each sheet? Yes, you can insert a table of contents as many times and to as many places as needed. Does the table of contents include a hyperlink to the sheet where it is inserted? No, for your convenience the add-in does not create a hyperlink to the sheet where the table of contents is placed.